Lakshmi (Sanskrit: लक्ष्मी lakṣmī) is the Hindu goddess of wealth, luck, royalty, beauty and fertility. She is also known as the consort of Vishnu (the preserver god in the Hindu Trinity) and is particularly prominent in Sri-Vaishnavism, a devotional school of Hinduism, as well as in the Pancaratra, in which she is worshiped as the supreme creator. Also known as Shri, Lakshmi is physically depicted as a radiant goddess dressed in exquisite garments and precious jewels. Her expression is consistently calm and loving. She is often depicted seated or standing upon a lotus representing purity and beauty. There are a number of festivals that place specific focus upon Lakshmi in her relation to Vishnu. Lakshmi and Vishnu are celebrated as the archetypal figures of marital bliss, and Lakshmi is recognized in her role as a devoted wife. She represents marital fidelity, longevity of the marital partner, fertility of crops, and acquisition or preservation of wealth. Considering the importance of these boons, and her reliable reputation for granting good luck, Lakshmi has established herself as one of the most widely worshiped Hindu deities. The early Vedas do not give mention Lakshmi by name but they do praise Shri, one of her various epithets. In these early texts, Shri was considered a quality that encompassed capability, skill and advantage, beauty, glory, and exaltation. In the later Vedas, Sri came to refer to the ruling power associated with the office of kings. Early myths also speak of Shri as a goddess, who personified ten qualities coveted by other divine beings: food, royal dominion, holiness, kingdom, fortune, sovereignty, nobility, power, righteousness and beauty. 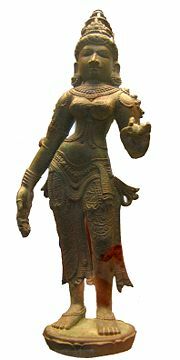 The Vedic Sri transformed into later conceptions of Lakshmi as the matron of royalty and dignity. In the Sri-Sukta, an appendix to the Rg-Veda probably dating back to the seventh century B.C.E. or earlier, the character of Sri-Lakshmi begins to become more recognizable in her current form. In this hymn, the goddess is called upon to bestow fame and prosperity upon her worshipers, as well as more concrete rewards such as livestock and money. She is lauded as the epitome of augustness, ornamented in gold and silver, and seated upon a chariot drawn by the finest horses. It is also here that Lakshmi becomes linked with the lotus and the elephant, two symbols that have been closely related to her ever since. Finally, she is associated with symbols of fertility, such as cow dung and the fecund soil of harvest. As Hindu mythology developed, the character of Lakshmi expanded on many of the traits of the Vedic Shri. The goddess became the personification of royalty, and was identified as the consort of a number of kingly deities (see below). By way of these partnerships, divine monarchs were able to maintain their virtue and status; in some cases they were even able to cultivate virtue that they did not already possess. Further, Lakshmi plays a special role as the mediator between her husband Lord Vishnu and his worldly devotees. While Vishnu is often conceived of as a stern, easily-perturbed patriarch, Lakshmi represents a more soothing, warm and approachable mother figure who willingly intervenes in the lives of devotees on his behalf. Often, it is Lakshmi who acts as the advocate for the request of a given mortal. One myth tells of such a case where Vishnu insisted upon the harsh castigation of a known sinner. However, before Vishnu could act, Lakshmi convinced her husband that his quickness to visit punishment upon the sinner would only compromise his reputation as a god of mercy and forgiveness. In many comparable cases, Lakshmi uses her beauty in order to distract Vishnu, thereby causing him to stray from his original intentions. Thus, when asking Vishnu for grace or the forgiveness of sins, Hindus often approach him through the intermediary presence of Lakshmi. Additionally, Lakshmi is widely propitiated in her role as a goddess of plenty and prosperity, who is beleived to bring material rewards to her followers. One myth tells the story of how Lakshmi's association with Indra caused him to pour down fertile rains, thereby allowing crops to grow. Meanwhile, cows produced an abundance of milk, and the all beings on earth prospered. Later, when Lakshmi left the world after she was insulted by Indra, the world lost all its vigor and vitality in her absence, gaining it back only when she returned. In this function Lakshmi has been given the epithet Aiswarya or "the wealthy," and consequently, anything that need be affluent in the life of a Hindu gets the auspicious prefix or suffix 'Lakshmi'. Altogether, Lakshmi is said to be responsible for seven kinds of wealth: They are monetary wealth (dhana), agricultural wealth, victory, elephants (a traditional Hindu symbol of wealth), wealth of courage, wealth of knowledge, and finally wealth of progeny. This last kind of wealth suggests Lakshmi's continued association with fertility in modern times, much like the Vedic goddess Shri. Cosmologically, Lakshmi's fertility is conceived of as Vishnu's maya, that is, the magical power that allows him to spawn the material aspect of the universe. Physically, Lakshmi is depicted as a radiant, shapely woman dressed in exquisite garments and precious jewels. Her expression is consistently calm and loving. She is often depicted seated or standing upon a lotus representing purity and beauty. Similarly, Lakshmi is the epitome of beauty and perfection (albeit she also is closely related to so many primal elements such as cow dung and odor). In many representations, Lakshmi is pictured alongside her husband Vishnu. In most of these depictions, the couple is shown smiling, holding hands, or else touching each other tenderly. Often they gaze lovingly into one another's eyes. Typically, Lakshmi is shown in a subservient position to Vishnu—this is communicated by her two arms instead of the usual four she possesses when shown alone. Often, Vishnu is pictured standing while Lakshmi sits on the ground leaning upon him. In some depictions, Lakshmi is present in two forms, Bhudevi and Sridevi, which sit on either side of Vishnu. Bhudevi is her personification of fertility (Mother Earth), while Sridevi is her personification of wealth and knowledge. In pictures or sculptures of the Lakshmi-Narayana variety, Narayana (an epithet of Vishnu) is seated with a dramatically smaller version of the goddess on his left thigh. Her right arm circles his neck, and his left arm is placed around her waist. Occasionally, Vishnu and Lakshmi are merged into one bisexual figure, suggesting their inseparable unity. It is also as common to see Lakshmi depicted beside Ganesha, the elephant-headed god. This is not surprising as Ganesha is comparable to Lakshmi in his ability to remove obstacles, bestow blessings of material wealth, and provide worshipers with good luck. Further, this association is consistent with Lakshmi's prevalent connection to elephants. Lakshmi's traditionally accepted vehicle is the owl, a bird that sleeps through the day and prowls during the night. Lakshmi is also commonly pictured in the presence of one or more elephants, a symbol of royal authority. Sometimes, these elephants shower Lakshmi with water, which may serve to suggest the fertilizing power of rain. Lakshmi's main consort is Vishnu, the exalted god responsible for preservation of the universe. Although Lakshmi assumes a position of subordination to Vishnu within the mythology of Sri-Vaishnavism, she is held to accompany him at all times. The two are linked in the story of the milk ocean (Ksheersagar), which is churned by the gods and demons in hopes that they will create the elixir of immortality (or amrta). Vishnu presides over this activity, aiding its progression by providing the serpent Vasuki to serve the purpose of the churning rope, and Kurma, the cosmic tortoise, an avatar of Vishnu who rests the churning stick upon his back. Lakshmi arises from the churned ocean of milk (earning her the epithet Jalaja or "daughter of the sea") and is immediately attracted to Vishnu in his position of authority. Lakshmi is thereafter linked to Lord Vishnu as his queen, and together they reside in Vaikuntha, his heavenly court. In this role she is the ideal Hindu wife, loyal and subdued. Together they represent marital contentment, domestic order and the benefits of the interdependence of male and female. Just as Vishnu incarnates into the material world to restore dharma when it has declined, so too does Lakshmi, accompanying him in the form of his wife. Most notably, Lakshmi incarnated as Sita, wife of Rama, the seventh avatar, as well as Radha, consort of Krishna, the eighth avatar. These two incarnations of Lakshmi have proved to be significant figures in Hindu mythology and have gone on to acquire their own significant following in worship, as well. Throughout her history, Shri-Lakshmi has also played the role of a wife or queen to various other divine monarchs in the Hindu pantheon. She is sometimes associated with the Vedic Soma, personification of the sacrificial beverage, attending to him after he performs the great sacrifice. In other myths, Lakshmi is considered to be the wife of Dharma, an apparent personification of the universal moral principle. She along with a number of her sisters were said to have been given by their father to Dharma for marriage. Lakshmi is also closely associated with Indra, who at one point ruled over the entirety of the Vedic devas as the prevailing sky god. Lakshmi's association with the fertile earth and Indra's association with the sky and other celestial phenomenon marks them as the archetypal mythological pair of earth mother and sky god. In another fitting match, Lakshmi was also associated with Kubera, king of the forest-dwelling race of gods called Yaksas. Kubera is considered a possessor, guardian and distributer of wealth, and as a Yaksa, functions as a prominent fertility symbol in Indian art. Thus, the reasons for his intimate relationship with Lakshmi are obvious. Considering all these male consorts, as well as the general inconsistency of material fortune, it is not surprising that Lakshmi gained a reputation for being somewhat indecisive in character. Hence, she has been given the epithet Chanchala, or "the one who does not stay at one place." That said, her link with Vishnu became virtually exclusive by 400 C.E., and gradually her character came to represent steadfastness and restraint as opposed to fickleness. Hindus worship Lakshmi most feverishly during Diwali, the festival of lights. Diwali is a time in which people pray for material prosperity. Many Hindus, particularly businessmen, can be seen worshiping their account books. Meanwhile, farmers may offer sacrifices of goats and sheep in hopes of a bountiful harvest. They also sometimes pay visits to dunghills collected for the purpose of fertilizing future crops, where they genuflect before it in the hopes of ensuring abundant crops in the future. Over the course of Diwali, clay images of the goddess along with those of Ganesha are worshiped throughout Northern India, in hopes of inheriting some of the good luck meted out by each deity. People also put small candles outside their homes in the hope that Lakshmi will stop by to bless them. Additionally, Some Hindus believe that ghosts walk the earth at this time of the year and Bali emerges from the underworld so he can rule for a span of three days. During the festival Lakshmi is invoked so as to mitigate the effects of the demon king's rule. By lighting lamps and creating a cacophonous clatter of pots and pans, Hindus believe that they are assisting Lakshmi as she banishes another demon, her older sister Alakshmi, associate with misfortune. There are a number of festivals that place specific focus upon Lakshmi in her relation to Vishnu. Lakshmi and Vishnu are celebrated as the archetypal figures of marital bliss, and Lakshmi is recognized in her role as a devoted wife. During another festival involving the divine couple, Vishnu is said to leave his home in order to take on another consort for a brief period of time. In response, Lakshmi plays the role of a jealous wife, breaking Vishnu's vehicle and temporarily locking him out of their home. Lakshmi is worshiped during the Kaumudi-purnima festival where women venerate her on a mound of new grain, recounting a story of Lakshmi's disappearance resulting in the subsequent deterioration of crops. With her return comes the return of abundance, and so the women who carry out these rituals acknowledge Lakshmi's ability to renew vigor in the crops. Likewise, Lakshmi is praised for this fecund ability during the Durga-Puja festival. Apart from these festivals, Lakshmi is also a consistent focal point of vratas, religious vows made regularly by devotees asking for the blessing of the goddess while promising to undertake some act of devotion to her in return. The boons requested or Lakshmi most commonly are marital fidelity, longevity of the marital partner, fertility of crops, and acquisition or preservation of wealth. Considering the importance of these boons, and her reliable reputation for granting good luck, Lakshmi has established herself as one of the most widely worshiped Hindu deities. In some circles, Lakshmi has been venerated to the rank of supremacy among the Hindu gods and goddesses. In the Pancaratra, an early school of Hinduism, Lakshmi is paramount in the creation of the universe, since she represents the shakti, or creative energy, of Vishnu. She is considered the sole active participant in creation, while Vishnu himself is relatively lax. With this in mind, Lakshmi has come to embody the Pancharatra conception of the divine creator and ultimately the supreme divine principle. As such, she dominates the Pancaratra conception of the Absolute, and is the focus of their worship. In the Lakshmi-tantra, a popular Pancharatra devotional text, it is solely she, and not Vishnu, who bestows grace upon devotees. 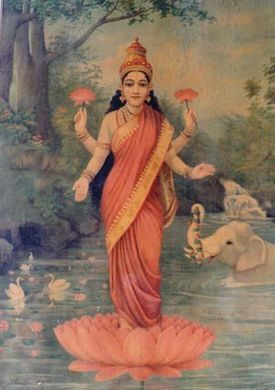 ↑ She has been given several epithets relating her to the lotus, including Padma or Kamala ("lotus dweller"), as well as Padmamaladhara devi ("one who wears a garland of lotuses") and Padmasundari ("One who is as beautiful as a lotus"). ↑ Separate myths of the demons Bali and Prahlada illustrate the power of Lakshmi to purify and elevate the moral status of her partners. In each case the demons abandon the whole of their malevolent traits while Lakshmi lives with them. In her presence, they rule their kingdoms evenhandedly, allowing their inner and outer virtues to be refined. With Lakshmi at his side, Bali even manages to defeat the mighty Indra in battle. When Lakshmi leaves each of these demons, however, they promptly lose their royal might and regress to their respective paths of turpitude. ↑ Alternative stories of Lakshmi's origin hold her to be the daughter of Bhrigu and Khyaati. Originally, she resided in the heavenly realm of Swarga but due to the curse of Durvasa, she left Swarga and made Ksheersagara her home. This page was last modified on 3 April 2008, at 22:17.